Today’s CometWatch entry was captured by Rosetta’s NAVCAM on 14 July 2015 from a distance of 161 km from the centre of Comet 67P/Churyumov-Gerasimenko. The image scale is 13.7 m/pixel and the image measures 14 km across. It has been processed in LightRoom to bring out the details of the activity, which is visible all around the sunlit side of the comet. The large lobe is particularly aglow with activity in this view, with numerous individual streams of gas and dust sweeping away from the nucleus. In some cases they appear to merge together some distance away. Although line-of-sight viewing conditions may contribute to this observation, higher-resolution images acquired with OSIRIS earlier in the mission also revealed this kind of detail. The elongated depression known as Aten is also visible on the comet’s large lobe in this view, its interior walls partially cast in shadow. 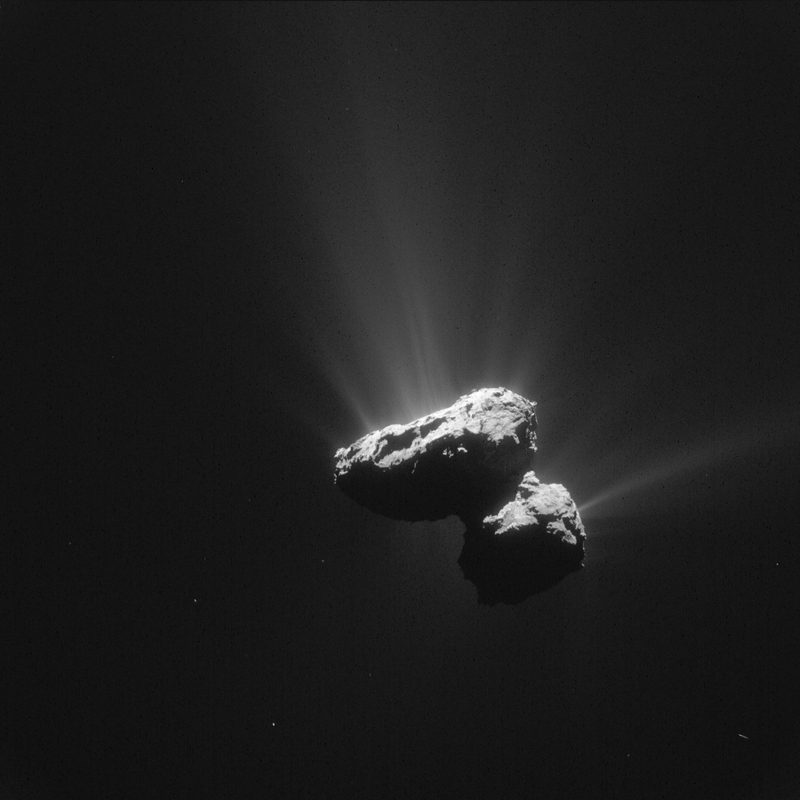 The large lobe is itself casting a shadow across the comet’s neck and onto part of the small lobe ‘below’. The silhouette of the comet towards the bottom left of the image is also clearly visible against the background glow of activity. Now things are starting to get going in the run up to Perihelion. The unprocessed image is spectacular enough. I’m not surprised communication with Philae is intermittent with all that going on. 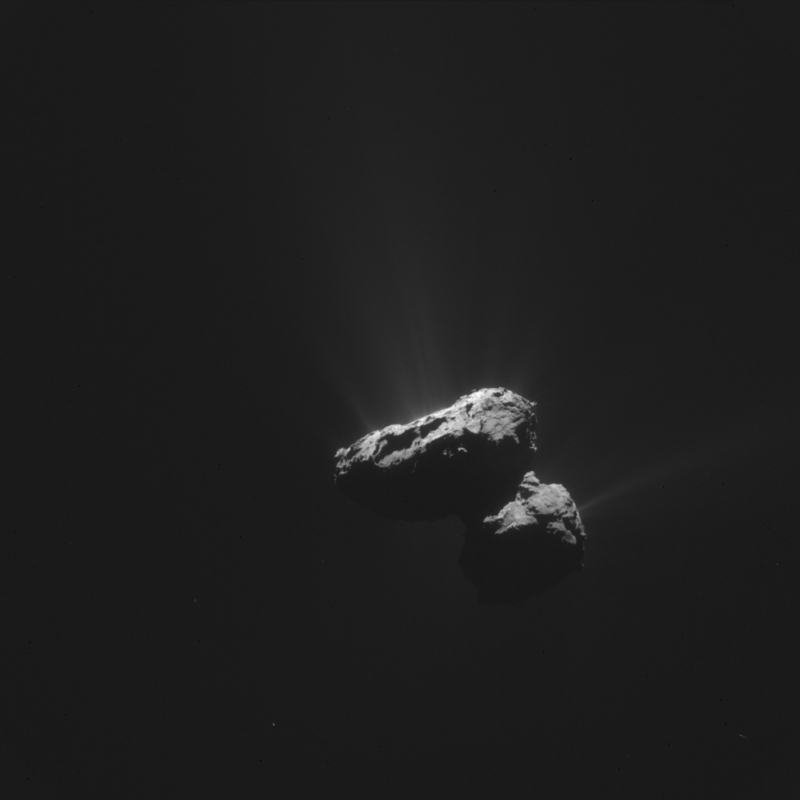 We might have to wait until the end of October until things improve and Rosetta can get closer again. Do we know enough about the amount of sunlight reaching Philae now, to estimate how long Philae could possibly operate after Perihelion? We first heard from Philae in early June and Philae seems to have been slowly waking up for a couple of weeks or so before that, so roughly 10 weeks away from Perihelion. This makes the end of October about the latest we might expect Philae is able to operate in any capacity, without judicious use of the secondary batteries. It is suggested 67P looks like Pluto in a blizzard. Now we see the surface of Pluto, the science of Rosetta is going to be key in understanding Pluto. The sublimation led surface geology in particular. The ices involved are different, but the phase change is the same so we can expect many of the features seen on 67P on Pluto. The two excellent papers recently made available by the OSIRIS team came just at the right time to help understand Pluto. Hi, for the enhanced versions it is essentially a matter of contrast enhancement. We always provide the original versions so that you can have a go yourself, if you wish. At what kind of velocities are the dust jets being ejected? And comets tails point away from the sun but a majority of the material is ejected towards the sun, because the jets are on the sunlit side. Is the solar wind enough to turn them the opposite way? Thx for this awesome blog. Looks like the jet from the small lobe is from Hatmehit, as before, but it seems narrower. After checking with Mattias Malmer’s Rosetta Now (14/07 18:40 UTC) Hatmehit seems to be a wrong guess, the jet should be somewhere in the Maat/Nut/Serqet region. So this is not the usual Hatmehit jet but maybe a new one. Suddenly (in calendar terms) it appears that many of the jets are narrower ie originating from smaller features. Any explanation for this. Any chance of correlating it in more close up surface imagery. Nice picture! So it was processed in Lightroom. What difference does it make? It seems to be an easy task any Raw Converter could do. Me gustaria conocer el sitio donde Philae se encuentra. Many of the jets here appear narrower than seen to date, by perhaps a factor of two or three, particularly evident with the thin perpendicular one from the right of the small lobe. Any explanation for this. Any correlation with surface features.